The state flag of South Carolina pays respects to its rich war history. Using the blue from the South Carolina soldiers' uniforms and a white crescent to represent their badges, Colonel William Moultrie originally designed the flag in 1775. In 1861, the addition of a palmetto tree was made in remembrance of the victory over the British Fleets on Sullivan's Island. The victory was accredited to the fort being constructed with palmetto logs, which were able to withstand and absorb the impact of the British cannons. 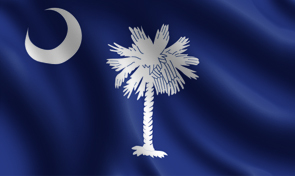 Waving this flag helps give South Carolina natives a feeling of state and national pride.